Southeast Arizona Medical Center: Services. Southeast Arizona Medical Center provides general medical and surgical care for inpatient, outpatient, and emergency room patients, and participates in the Medicare and Medicaid programs. Inpatient Care - kind, compassionate, highly skilled. Physical Therapy - fun, family atmosphere with many specialties. 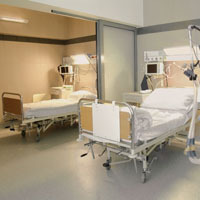 Southeast Arizona Medical Center has a skilled nursing unit referred to as Swing Bed. Our Swing Bed program provides round the clock care for patients who are in transition between an acute care facility and either their home or a long term care facility. Those patients who benefit from a Swing Bed program have had recent joint replacements, are patients with strokes, cardiac patients and patients with long-term illnesses. All who could improve their level of capability and function with continued daily therapy. Cataract Surgery & Retina Laser Surgery - service offered at SAMC by Dr. Hodges, a Tucson specialist. If you have any more questions about the services we render here at Southeast Arizona Medical Center, please, contact us here.